Let your Representatives and Friends know you believe Health Care is a Human Right! "Intent to cover all Washington residents"
Since 1987, Physicians for a National Health Program has advocated for reform in the U.S. health care system. A large part of our work involves educating health professionals, and others, about the benefits of a single-payer system - including fewer administrative costs and providing comprehensive health insurance for all residents of the United States. The Centers of Future Health Care"
For our April 17th meeting, we are fortunate to have two leaders in the community health centers system in the Seattle area. Raleigh Watts is CEO of the Country Doctor and Carolyn Downs Community Health Centers. Rich Kovar, MD, is a longtime Country Doctor family physician who has taken a leadership role there for decades. They will talk about the role of CHCs - the patients they see and the type of unique comprehensive care they offer, how they are financed now. "CHCs are the future of health care." There will be a lively discussion about how CHCs might be affected by the new improved Medicare for All Acts of 2019 - Pramila Jayapal's HR 1384 and Bernie Sanders's new bill, just introduced April 10th. May PNHPWW Monthly Meeting - May 15th, 7:30pm at Swedish/Cherry Hill Campus, SECC Rm C. Program to be determined. Actions you can take to help pass universal health care legislation: Encourage Congressional Representatives to support HR 1384, the true single payer Improved Medicare for All Act of 2019. So far, only two of our WA reps have signed on in support (Lead Sponsor Pramila Jayapal and Adam Smith). Senator Bernie Sanders re-introduced his modified Medicare for All Act of 2019 on April 10th (no bill number yet). It needs some improvements. You can use this link, put together by HOPE (Health OverProfit for Everyone), to send him a message about improvements you would like to see. PNHP President Adam Gaffney addressed the students (talk begins at 41 minutes of the YouTube video) on the history of HC reform, where we are now, & that single payer activists need to be brave and know we can make a difference. The Model for a US Single Payer System"
If you missed this symposium, you missed great presentations and discussion on the strengths and challenges of the current VA system and, particularly, the recent attempts to expand its privatization. Fortunately, Mike McCormick of KODX filmed the forum which is available on the KDOX YouTube Channel by clicking here. Dr. Lindo led the discussion on the intersection of race, immigration, and other social determinants of health with our current healthcare system and how a Medicare for All system could help address some of these issues. The UW chapter of Students for a National Health Program sponsored the very well attended event held in a UW Med School campus lecture hall. It was co-sponsored by PNHPWW and served as our regular February Monthly Meeting. Pramila Jayapal, WA CD 7, announced the long-awaited new and improved Medicare for All legislation at a press conference in Washington DC on February 27th. Other speakers included Adam Gaffney, President of PNHP (pictured) and others representing other orgnizations who had input on the bill. You can watch the press conference here. Rep. Jayapal speaks for the first 10 minutes and Adam Gaffney at the 49-52 minute mark. The bill has been refered to several committees, but is expected to have a hearing in the House Rules Committee by the end of March. 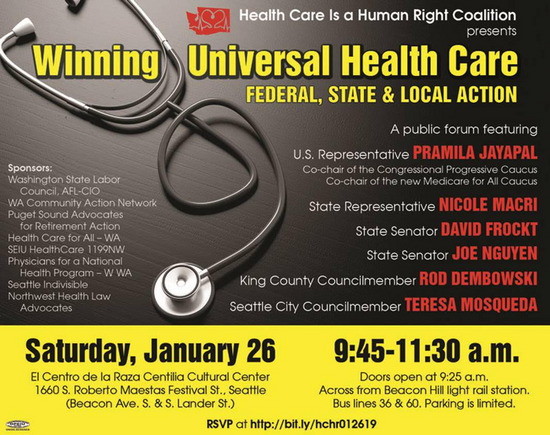 The Health Care is a Human Right - WA Coalition sponsored an important public forum on Saturday, Jan 26th, titled “Winning Universal Health Care - Federal, State and Local Action.” The forum looked at ways to move health care reform forward in 2019 and beyond. The panel was composed of lead sponsors of universal health care legislation at all levels. US Representative Pramila Jayapal, lead sponsor of Medicare for All was unable to attend due to the gov't shutdown but addressed us by video from DC. State Rep. Nicole Macri, State Sens. Bob Hasegawa, Joe Nguyen and David Frockt, lead sponsors of state legislation, Rod Dembowski, King County Council Chair, and Seattle Council Member Teresa Mosqueda participated. It was held the at the El Centro de la RazaCommunity Center on Beacon Hill. seeing the text of the bill and what is publicly known about it - with the caveat that PNHP will continue to educate about any changes it may like to see in the bill as it makes its way through Congress. The PNHPWW Board looks forward to seeing the full text of the legislation when it is introduced and will chart our advocacy strategy at that time. We had a great meeting with speakers Lilly Adams and Joe Berkson, MD, from WPSR as our speakers and discussion leaders. They are building a statewide coalition - Washington Against Nuclear Weapons Coalition to raise the awareness of what the nuclear arms race is doing to many issues of social justice, including the social determinants of health and access to care. Health over Profits for Everyone (HOPE) describes an in-depth strategy analysis on how the single payer movement can win National Improved Medicare for All (NIMA). HOPE recently sent a letter to Rep. Jayapal regarding the need for transparency in updating HR 676 before it is introduced in February. Seven PNHPWW and SNaHP-UW members attended the 2018 PNHP Annual Meeting in San Diego, Nov 8-11. The theme of the weekend was "Tearing Down the Barriers to Care." On Friday there was an educational session for folks new to single payer advocacy followed by a march/demonstration in support of immigrants in front of the San Diego ICE headquarters. Also, there was a meeting for people working on state-based universal health care legislation - summary here. John Geyman, MD, joined us via the internet from his home in Friday Harbor to describe his just-released book "TrumpCare: Lies, Broken Promises, How It Is Failing, and What Should be Done." It's four goals are: 1) to describe TrumpCare; 2) show how it is failing patients, families, taxpayers, and the nation: 3) describe the growing crisis is health care in this country; and 4) to compare the only two real alternatives before us - continuance of TrumpCare or moving to single-payer Medicare for All. Also, John compared HR 676 and S 1804 and gave us his thoughts about their relative strengths and weaknesses. Crisis in US Health Care: Corporate Power vs. Tho Common Good looks at how, over the last 60 years, our health care system got to be where it is now - how it changed from a system devoted to patient care to one devoted to maximizing revenues. The Human Face of Obamacare - Promises vs. Reality and What Comes Next shows the human face of the ACA as the stories of real patients and their families best illustrate continuing problems of our health care system. It also shows how many of the promises made by the Obama administration have not been kept. How Obamacare is Unsustainable - Why we need a Single-Payer Solution for All Americans documents where the ACA fails and the fix we need. Health Care Wars - How Market Ideology and Corporate Power Are Killing Amercians examines how our market-based system benefits the 1% at the grave expense and suffering of the 99%. "Breaking Point - How the Primary Care Crisis Endangers the Lives of Americans" documents the crisis in primary care in the US and what we must do about it. Keeping Single Payer in Medicare for All "
"Community House Calls/Interpreter Services Harborview Medical Center"
"The State-Based Universal Health Care Act"
Rachel Berkson CD7 District Director for Rep. Pramila Jayapl, described HR 6097 and led the discussion. David Loud, Jim McDermott's staff who worked on similar bill & helped with HR 6097 also lent his expertise to the discussion. HR 6097 would facilitate states to combine several federal health care funding streams if the state offers a comprehensive universal health care plan that guarantees all residents of their state are covered. The benefits provided by states have to be equal or greater than what beneficiaries receive now. The regular PNHPWW May Monthly Meeting was held in conjunction with a Town Hall programmed and sponsored by the Students for a National Health Program - UW Chapter (SNaHP-UW) and co-sponsored by PNHPWW and Health Care for All - WA. We were privileged to hear from Jacqueline Martin and George Sidwell, formerly homeless Real Changevendors. They described their experiences about the real issues and obstacles facing people who are homeless, how difficult it is, even for very sympathetic people who want to help, to understand their day-to-day-day struggles - including maintaining health and getting care from consistent and caring providers. We had a great meeting on state and national health care for all strategies sponsored by PNHPWW, United for Single Payer, and Whole Washington. We brought in Margaret Flowers and Kevin Zeese for the national perspective and Erin Georgen of Whole Washington for the state legislation perspective. Though the YouTube video ( https://www.youtube.com/watch?v=JlIBzLhpbzw&t=329s ) is 100 minutes, it is very useful and worth watching in its entirety as we move ahead inn 2018. This was our first use of the Zoom platform that worked vey well for the first time out. We will use it for our regular monthly meetings so that others, local across the state, not able to be at the meeting can participate. Georgia Davenport of the Whole Washington organization talked about their campaign to pass a ballot initiative Initiative I-1600 that would create the Whole Washington Health Care Trust that would run a new universal health care program, housed within the state Department of Health. Laura Fielding of Red Berets for Medicare talked about plans for an event in Wright Park in Tacoma on May 6th, National Nurses Day,including a March for Medicare. They are looking for nationally prominent speakers. They have the park from 10am - 6pm. Opportunity for PNHPWW to have a speaker and table. Watch the meeting on YouTube - https://youtu.be/I9CBFt_6VDk? Jan 18th - WA Senate Health Care Committee Hearings on Single Payer bills - SB5957 and SB5747, similar to the House Bill "The Washington Health Security Trust"
Speaker & discussion leader - Jonathan Knapp, Past President of the Seattle Education Association gave a great presentation on developing leadership in progressive organizations. A video of the meeting is available here. Jonathan's Powerpoint slides are available here. This documentary film explores the problem of extreme drug prices in the US and how drug costsimpacts on the public, on businesses and the overall US economy. It makes an effective business case for realizable change, digging deeply to answer key questions. You can watch the film by clicking here - https://fixithealthcare.com/big-pharma-movie/? "Big Pharma" was produced by Richard Master, the producer of "Fix It: Health Care at the Tipping Point." We were fortunate to have pharmacist Ronnie Shure with us to comment on the film and lead the discussion. "Dare to Dream" is a 30 minute film that tells the story of the Latin American School of Medicine (ELAM) in Havana, Cuba, the largest medical school in the world. Considering the continuing bad news at the about the current state and future threats to our health care system, it was very nice to hear some good news about an influx of dedicated, socially conscious physicians who work for health care for all. At this meeting PNHPWW and SNaHP-UW members who attended discussed their impressions of the weekend and gave reports on the high points of the workshops they attended. There were 12 workshops, some ad hoc sessions, and lunch and dinner speakers as listed below. It was not really possible to review all of these during our PNHPWW meeting, but most of these had slideshows or handouts that are worth reviewing closely. You can download for off-line access here. Launched Feb 1st. focused on organizing for national SP legislation HR676. Initiated by Margaret Flowers, Kevin Zeese and others. Website with valuable information about advocacy and events. Holds regular national conference calls at 9 pm Eastern/6 pm Pacific. These calls are open to everyone, but you must register to receive a number. These calls will provide political updates, educate about National Improved Medicare for All, discuss strategy and plan actions to change the political culture in the United States so that NIMA is the only politically viable solution. There are 15 Annual PNHP Meeting slideshows of the plenary presentations and workshops that you can review and use the information for local activities, presentations, LTE’s etc. You can see the list of slideshow topics with links to them by clicking here. Suggested Reading : “Health Reform in the Trump Era: A Big Step Back, But Possibilities for Bigger Steps Forward” – Woolhandler and Himmelstein , Nov 16, 2016. This powerful documentary that takes a look at how our health care system is damaging our economy, suffocating our businesses, discouraging physicians, and negatively impacting on the nation's health while remaining unaffordable for a third of US residents. Film producer Richard Master, founder and owner of MCS industries, produced the film. He faces relentless annual cost increases to provide health insurance for his employees. "Fix It" is a result of his journey to find a solution to the dysfunctional US healthcare system. The updated Physicans Proposal was released May 5th via the American Journal of Public Health. Several PNHP leaders were involved in the writing. More than 2,200 physicians have endorsed it so far, including 111 in Washington State. You can download the PNHP press release here The full text is available here and PNHP has released a Summary and Fact Sheet. Students for a National Health Program at the University of Washington (SNaHP-UW) brings the movement for universal healthcare through a national single-payer system to campus. SNaHP-UW seeks to educate and organize undergraduate and graduate students from health science, law, economics, political science, and beyond to add their voices to the growing chorus of healthcare professionals and students calling for healthcare for all. PNHPWW member Mark Hickling has produced a 12 minute video describing the US health care system and those of other developed nations in a down-to-earth way that we can use in our advocacy with friends and family. This video is great for opening a meeting or houseparty. You can watch this on YouTube by clicking here or on the photo. If you'd like a DVD copy ($5 for materials and postage), send a request here. Educate yourself about single-payer using the resources & materials -here and here. Bring materials and talk to your church, labor, community or other group about the singlepayer solution.